"Jeron Johnson #20 of the Washington Redskins and teammates are introduced before playing the New Orleans Saints at FedExField on November 15, 2015 in Landover, Maryland." The best part about being apart of a team is leaning on one another to make great images. The end result is always the same - what's presented to viewers as a team - not as a individual. So what holds true on the field for athletes is exactly the same for photographers. There are days you feel like nothing came your way - or you didn't live up to your own goals to help the team. Whether that's passing for multiple touchdowns as a quarterback or capturing said touchdowns as a photographer. But that's what teammates are for. To help motivate, inspire and carry one another along each and every week - good game or bad. Recently the Washington Redskins have been coming out for player introductions as one team. No individual intros. 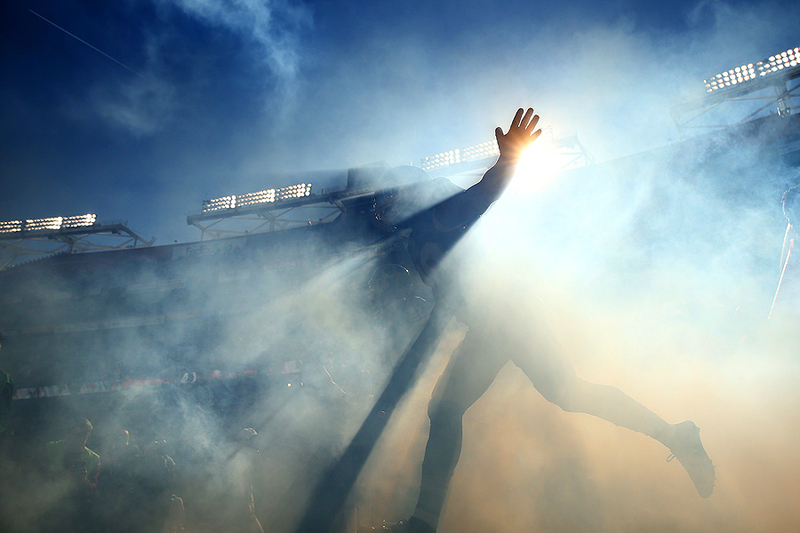 And while the above is singular, I couldn't help not play with the light and smoke as they made their way onto the field. Maybe next week I'll get more layers with a moment like this to tell that story of being one team.